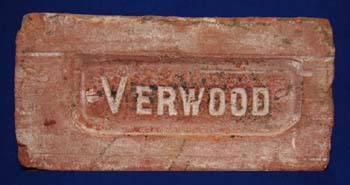 Verwood Brick & Tile Making. Note that this article was originally written in 1968 by Mrs. P Reeks. 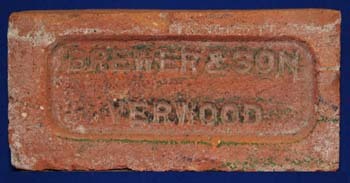 The brickworks began operating in Verwood in the 1840s. One at Ebblake, on the Hampshire-Dorset border, produced white and red bricks and drain pipes from clay dug on the site. Apparently the white bricks were used decoratively in house building. These can still be seen in many houses in the village today. This brickyard closed about 1908 to 1909 as apparently the seam of clay had been completely dug. The Blackhill brickyard was situated on a seam of London Clay. Mr. E. Batten who used to work in the brickyard, said that the work involved which was strenuous, to say the least. The clay was dug from the pits and mixed with loam or sand in an enormous pug mill. This mixture was then forced into a chamber which squeezed the clay out in a long slab. A piece of mechanism was worked by foot to bring eleven cheese-wires down, which cut ten bricks at a time. With a piece of metal the bricks were pulled on to a board on a table, and from there three boards of sixty bricks were placed on a brick-barrow. This was longer than a garden wheel-barrow and was made of wood with a cast iron wheel. I was told that in wet weather when the ground was saturated, that a barrow load of bricks took a great deal of strength to move. The bricks were wheeled outside to be placed in the "hacks" to dry. The "hacks" consisted of clots of earth as a base, weather boarding at the sides and a wooden or corrugated iron "cap" to protect the bricks from the weather. After being dried the bricks were fired in a German type kiln, which was fired from the top. The kiln had twelve chambers and three firing holes and was a continuous kiln, which meant that the chambers were fired in rotation. Each chamber of bricks was at one of three stages of the process i.e. either (1) drying to re-move the steam (2) firing or (3) cooling. The German kiln had flues through each chamber which were brought into use by the opening of the dampers to raise the heat and cooled down by the dampers being closed. Across the Ringwood road from Blackhill on the land which is now the Strathmore Housing Estate, I am told there was another clay-pit. Drain pipes were made there and wheeled across to the Blackhill kiln for firing. There was also a further brickyard near the station where clay was dug on the site and worked on the same principles as the Blackhill works (which incidentally closed down in 1930) and had a German type kiln. For information about the now demolished Gotham Brick & Tile Company Works in Verwood please select the link.